With a booming economy and a diverse collection of neighborhoods, there's a strong market for Atlanta luxury homes for sale. There are upscale luxury homes and condos in Midtown and Downtown Atlanta that provide gorgeous views of the cityscape. You can also find sprawling multi-million dollar estates in areas such as Buckhead, Virginia Highlands, and West Paces Ferry. These homes boast unrivaled features and lavish amenties and must be seen to be believed! 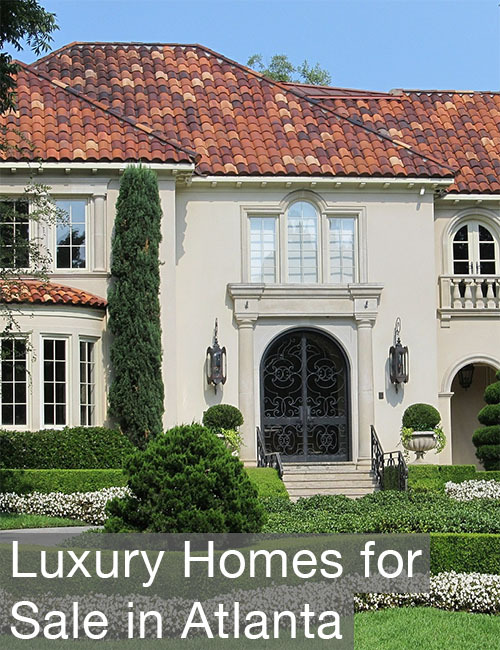 No matter what type of property you're in search of, there are plenty of Atlanta luxury homes to suit your particular needs and budget. The luxury Atlanta real estate market has seen particular growth in the last few years, as buyers discover Atlanta is a sophisticated, cosmopolitan city that will continue to thrive economically for many years to come. The luxury Atlanta real estate market has properties for sale that feature some of the finest architectural designs and interiors available anywhere in the country. There are a number of historic homes in Atlanta that have spacious yards that are bordered by tree-lined streets and pristine neighborhood parks. Many of these upscale estates have been meticulously cared for over the years, or have been remodeled to reflect current tastes and trends. Look below to discover the most up-to-date luxury homes for sale listings, or learn more about the upscale real estate opportunities in Atlanta. Stay ahead of the game. Sign up with us to access in-depth property listings and exclusive search parameters. Registering is free, quick and easy. Have a particular neighborhood you want to look at in mind? These are some of Atlanta's finest. The Keen Team would love to discuss your Atlanta luxury real estate opportunities. Contact us online or call us at (404) 270-9374 to find your perfect property.